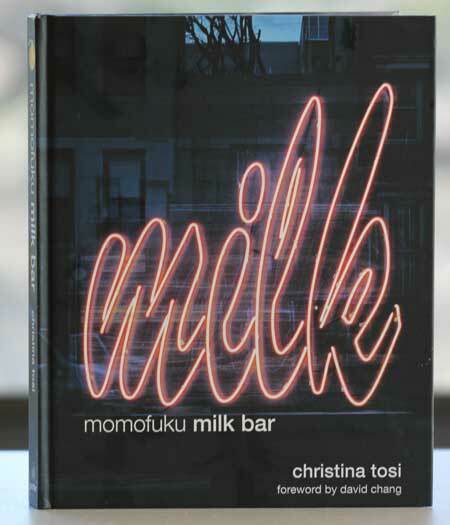 Milk Bar is one of my favorite places to buy cookies in New York, so naturally I put their new book on my Christmas list. Given the fact I’d tried all the “clone” Milk Bar cookie recipes I could get my hands on with varying degrees of success, my hope was the book would lay it all out with clear directions, ingredient descriptions and recipes for the cookies I liked best such as the Compost Cookie and the Cornflake Butterscotch Marshmallow. The book delivers on all points and more. And while I am particularly fond of cookies, those of you interested in sorbet, ice cream, pie and cake, will be happy with the variety of other types of recipes. Plus the book is enjoyable to read in and of itself. The book has detailed descriptions of the ingredients used by the bakery, uses gram measurements instead of just volume, and features truly innovative recipes. Rather than just a collection of regular cookies with different ratios of the usual sugar, flour and butter, the base dough in each recipe includes a unique “crunch” or “crumb” – a pre-baked mixture of milk powder, sugar, salt, butter or oil and other ingredients that makes it distinct. For instance, the “cake batter crumb” used in the cookies I made today includes sprinkles and clear vanilla, while the Ritz crunch calls for Ritz crackers. 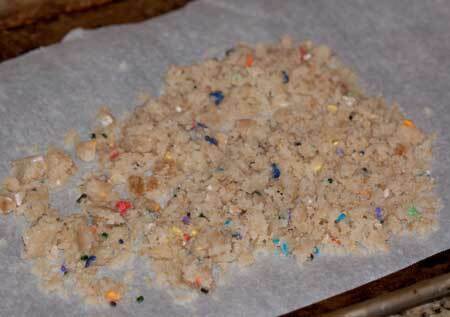 Here’s a photo of the unbaked cake crumb. The crunches and crumbs are what make the cookies taste like the ones you buy at the bakery, but there were lots of little “Aha!” moments as I read through the ingredient descriptions in the book. Those tips may or may not show up in Internet versions of Christina’s recipes. 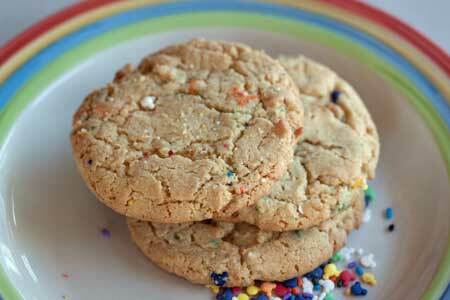 As mentioned, Serious Eats has the recipe for Milk Bar’s Confetti Cookies. They were great as written, but here are a few things to consider: Because the cookies have so much butter, the bakery likes using bread flour. I tested with bread flour and regular flour and both versions worked, though the bread flour cookies had a little more chew to them. For butter, the bakery uses European style (Plugra). I used regular unsalted and it was fine, but I’m sure some of the recipes such as Compost Cookies would be much better with Plugra. As for the salt, make sure you use coarse salt, but if you’re stuck with table salt, just weigh it out in grams or cut it in half to make sure you don’t overdo it. Glucose is an important ingredient in a lot of recipes, and while you can use a little corn syrup in its place, Christina recommends ordering glucose on line because “you’re worth it”. So I guess the glucose really makes a difference. I bought some glucose at Michael’s a while back (they sell it in the cake decorating aisle), and it was an interesting ingredient, but I’m still not sure if the Wilton version is the same as Christina’s. Guess I have more research to do. Anyway, Fuzz loved the Milk Bar version of confetti cookies, and while sugar cookies aren’t my personal favorite, the crunchy on the outside, soft in the center texture made these special. I can’t wait to try a few more recipes from the book. If you own the book and have tried a few other things, I’d love to hear your feedback or get a link to your blog post. Thanks! Yum. I know I’m late to comment, but I just made the cornflake marshmallow cookies and the confetti cookies and thought they were both fantastic. Like you, I love the little add ins in the cookies and think they make them very, very special. It’s already making me think of what other things I could play around with to do something similar. I especially love the birthday cake crumbles and have been thinking it would be fun to do an ice cream bar with homemade cake batter flavored ice cream and then dip it in white chocolate and roll it in the crumbles. I almost bought the Michael’s glucose but got nervous that it seemed too simple so I ended up buying another version from a baking supply shop instead. Probably not worth the trip, though I did find invert sugar which I’ve wanted for other recipes so I guess that makes it better. I also got this cookbook for Christmas. I have made the crack pie for the past 2 Thanksgivings but from the Bon Appetit magazine. I see that the cookbook calls for corn powder which is not in the other directions. I am looking forward to making it with the revision. My first recipe from the book was the Birthday cake. It was amazing! I decided to double the batch and make it into a layered sheet cake for our family get-together for my daughter’s birthday. It got plenty of compliments but just didn’t wow me as much as the smaller 3 tiered version. I made the Carrot cake for my mom’s birthday and we will be eating that tonight. Each component tasted great on it’s own so I’m looking forward to the result. I made bagel bombs for a neighbor who just had a baby. Doubled that batch for our family to keep some too. Those were great! I also made an herbed cream cheese version. Not as good but I wanted some variety. Lastly, I have the confetti cookie dough in the fridge now, waiting to be baked up. I think I must have gained at least 5 pounds since Christmas eating all this stuff! The dough, crumbs, and frostings are irresistible themselves! Stephanie, I think they’re supposed to be that way. When I bought some cookies at Milk Bar, they were so buttery that the bag they were in turned greasy. I got this cookbook for Christmas and have made the Compost Cookies and Blueberry & Cream Cookies so far. Both were delicious, buttery, and salty – but maybe too much so. When I make either cookies again I will definitely reduce the butter from 2 1/2 sticks (for 12 – 15 cookies!) to 1 1/2 or 2…and I would probably cut the salt in half. Everyone who tries them loves them but they are greasy to the touch and a little heavy for a cookie. Have you found that with these recipes as well? You’re luck to have found the book in the library! About the Crack Pie, that one has a huge following but I’ve never tried it and it’s not first on my list of things I want to make. Not sure why, but I think I’d rather just eat the Ritz Crunch that goes into it straight. About the flour, I perceive the bread flour cookies has having kind of a sturdier shell. It’s not something most people would notice, but if you bake a lot of cookies and like to compare textures, then you will. These days I keep bread flour in the freezer especially for certain cookies, muffins and the occasion batch of actual bread. I just pulled the Milk Bar cookbook from the Manhattan Beach (California) library and I LOVE IT! I’m with you: there are several AHA moments while reading through the ingredient descriptions and I thoroughly enjoyed reading about the bakery opening. I’ve made the Crack Pie (“meh” served at room temp/warm, ethereal served cold?!?!) and the Ritz Crunch (another item I’d label “crack!” That stuff is CRAZY addictive!). I came across your site googling “reviews” for Milk Bar recipes (?) and am wondering if you preferred the texture of the bread flour cookies over the AP flour cookies? I just ran out of bread flour and am just curious about the results w/ the bread flour. My kidlets LOVE the overly-vanilla’d Funfetti Cookies and I can’t wait to try Milk Bar’s recipe… Many thanks, and you’ve got a GREAT site that I’ll add to my browsing rotation ;-)! I love reading all your cookie experiments. I own the book too, and you have described it perfectly. I made the chocolate cookies and the corn cookies and recommend both highly. I had my husband smuggle in freeze dried corn from the US just to make the corn cookies and they wowed my whole family, even my butter-watching Dad. I had less luck with the compost cookies but I guess I took a little liberty with the recipe. I made the crack pie from the Bon appetit recipe, and the candy bar pie, which was a LOT of work and rather OTT, and they were worth it, if only because they are crazy and special. In place of glucose I use golden syrup or such, and haven’t had any problems, and of course, being in Europe, I use local butter (82% fat). Have fun with the recipes! I got the book for Christmas, but have not really even had a chance to look through it yet. Hopefully soon!! Corn syrup is a form of “real” glucose made from cornstarch. The most common form of glucose is dextroglucose, a naturally occurring form commonly referred to as dextrose (also called corn sugar and grape sugar). This form of glucose has many sources including grape juice, certain vegetables and honey. It has about half the sweetening power of regular sugar. Because it doesn’t crystallize easily, it’s used to make commercial candies and frostings, as well as baked goods, soft drinks and other processed foods. A 16 oz. container of CK Products Glucose, which is corn syrup, is available at my local Mennonite bulk store for $3.35. You can buy it on Amazon for $16.95, including shipping. Gloria, I think it means “lucky peach”. Carol, homemade treats are still allowed at some of our schools, but the rules are different wherever you go. If you thought the cake mix ones were greasy, you’ll love these. Despite all the butter, they aren’t greasy at all. I love funfetti cookies! This book looks really interesting and I’d love to try out some of their recipes. I may just have to get it! I want this book! My youngest would love these cookies in particular. I used a confetti cake mix one time to make cookies so he could take a treat in for his birthday and he wouldn’t stop talking about them. This was years ago, I don’t think homemade treats are allowed anymore. I always wanted a scratch version. The cake mix one was too greasy for me, but the texture was great. I love the name Milk Bar. It sounds delicious. I’m wondering what is momofuku? Have a good new year Anna and all your followers! Fun! I was just in NYC for the holidays and went to Milk Bar for the first time and brought home some of their freeze-dried corn powder so I can make the corn cookies! I was on the fence about this book, but now I will definitely buy. Thanks for the review. Coarse crystals are larger so you need about double what you’d use of table salt or kosher salt that is not labeled “coarse”. If a chef makes a recipe with 2 teaspoons of coarse kosher and you use 2 teaspoons of a less coarse salt kosher (e.g. Morton kosher measures like table salt), your cookies will come out a lot saltier. If you measure the salt in grams, it’s a non-issue. I love your description of the sugar cookies–like you, I find sugar cookies to be rather unexciting, except when they are quite thick and have that crunchy-on-the-outside-soft-on-the-inside textural contrast. I will check out the cookbook, but to be honest, I probably won’t use the glucose. I’ve actually never eaten Funfetti, btw–I think it was introduced just as when I was beginning to ‘age out’ of its target demographic. Anna – I always find this confusing, could you explain or give examples of coarse salt? I got this book for Christmas and am anxious to try out some recipes. It’s certainly a unique cookbook! I bought the book as soon as it came out, but I haven’t tried anything from it yet! I have this cookbook from my library and I’m in love! Look at the ingredients on the Wilton “glucose” from michaels- it says the only ingredient is corn syrup! I think real glucose needs to be ordered online but I haven’t done that yet. I’m so glad you got this book and am so glad that you did a review of it. Now I want the book too!! The cookies look deliciously interesting! The part about ordering the glucose because “you’re worth it” made me laugh out loud!